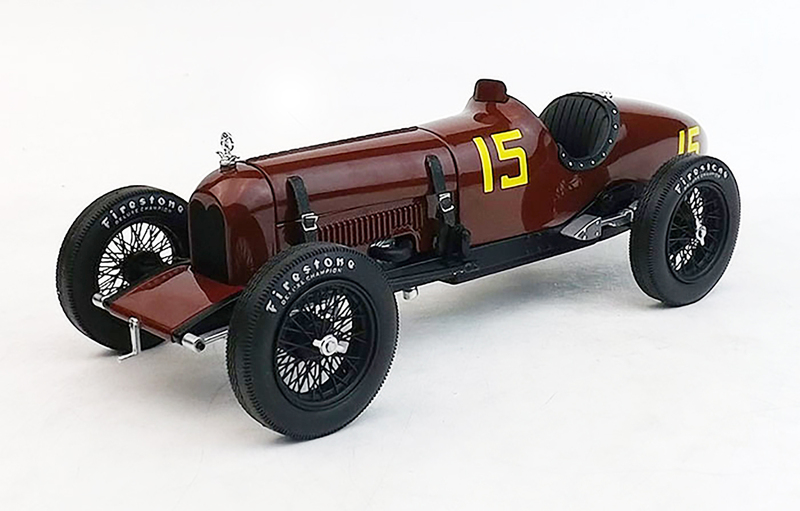 Indianapolis-based Duesenberg Automobile and Motors Co. was a powerhouse at the Indianapolis 500 in the 1920s, winning three out of four years from 1924-27. Duesenbergs were known for their strong engines, and the company made marine and aviation engines during World War I. But following the war its founding brothers, August and Frederick Duesenberg, moved the company to Indianapolis. They loved powerful engines and created some of the best of the era for their Indy racers. They also made competitive chassis for Indy racers. 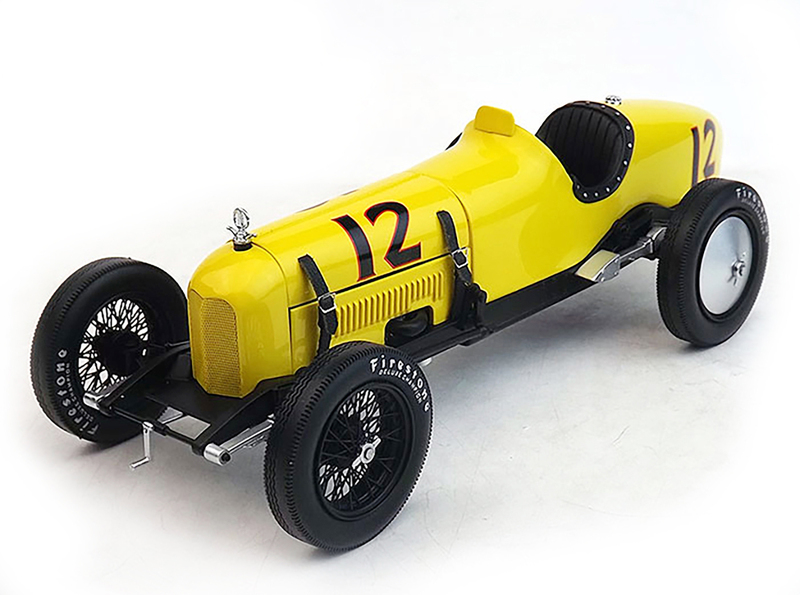 Now Replicarz, which has made 1/43 scale 1920s Miller racers, turns its attention to 1/18 scale resin versions of the Indy-winning Duesenbergs. They’re sharp, as usual. Duesenberg won its first Indy 500 in 1924, the first car with a supercharger to win Indy. Drivers L. L. Corum and Joe Boyer shared the driving duties and the following year the popular Peter DePaolo, won in a bright yellow Duesy. After Frank Lockhart won aboard a Miller in the rain-shortened 1926 race, Duesenberg was back in the winner’s circle in 1927 with George Souders at the wheel. It was Duesenberg’s final Indy win. The outgoing DePaolo, who later authored the autobiography Wall Smacker, is noted for being the first driver, and car, to average more than 100 mph for the entire 500 miles at Indy. His record was 101.127 and lasted until 1932 when Fred Frame averaged more than 104 mph. But that speaks to the power of Duesenberg racers and its factory-sponsored team of drivers. Duesenberg’s featured high-tech engines for the day, including the use of aluminum pistons and superchargers, and also were the first to use hydraulic brakes. The 1924 win was unique in that Corum and Boyer each drove roughly half the race, with Boyer taking over in fourth place on lap 111. He drove to the checkered flag, leading 25 of the 200 laps, and won by roughly 90 seconds, the closest 500 at that time. The duo split $20,000 of winnings, but Boyer would die in an accident later that year. In 1925 not only did DePaolo set the race speed record, he set the individual lap speed record in his Duesenberg as 4-lap qualifying became the norm. DePaolo ran a speedy 114.285 single lap. He led a dominating 115 laps in the race, but had to take relief for 21 laps. When he returned to his car he was fifth and had to drive his way back to the front. The 1927 win by Souders, a Hoosier, is unique in several ways. First, Souders was a rookie at Indy. But he also won by a record 8 laps over Earl Devore, and was the first driver to win while driving the whole distance without relief, or having a riding mechanic. Additionally, it was powered by a 90.29cc engine, the smallest to ever win at Indy. Reportedly this car was the same one DePaolo won with in 1925, but Souders said differently. For those wondering about the 1922 winner, Jimmy Murphy, who is credited with winning in a Duesenberg, well, that’s half right. Murphy, who later won the French Grand Prix in a Duesenberg, won the 1922 Indy 500 in a Duesenberg chassis, but packing a Miller engine. But that’s another story! Replicarz sent us the dark wine (reddish brown) 1924 Duesy and it was, well, a … you know. The hood pops off in two pieces, the top featuring three leather straps with buckles and a second lower panel on the left side has notches that hold it in place with a hole to expose the black pipe coming off the big round supercharger. The 122 cu.in. straight 8 engine is silver with piping to the radiator and electrical wires coming off the center-mounted distributor. Up front on the radiator cover is a chrome Duesenberg radiator cap and emblem. Sharp radiator cap and engine crank at the nose. 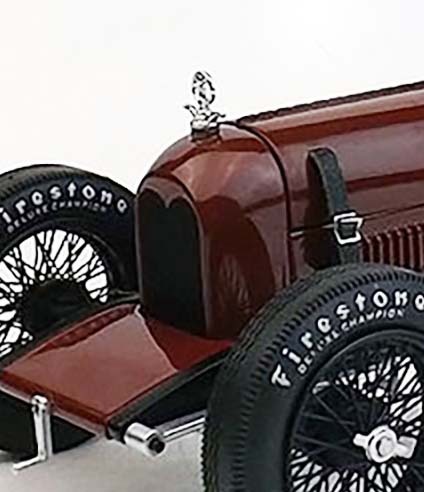 Replicarz creates handsome black wire wheels that hold Firestone branded tires that are half treaded, half slick on the left side to aid in all those left-hand turns at Indy. There’s a chrome gas cap behind the driver’s cockpit and only a yellow No. 15 on both sides of the cowl in front of the cockpit and the tail to help Indy’s scorers properly identify the car. No sponsor logos in 1924. The cockpit includes a black leather-look seat with black trim and silver rivets to hold it in place around the cockpit’s edge. The black steering wheel is a 4-spoked number with silver hub. Five glass-faced gauges are visible on the dash and there are pedals on the floor and a brake pressure pump handle to the lower right of the dash. A small painted windscreen rests in front of the cockpit to help protect the driver by deflecting debris. 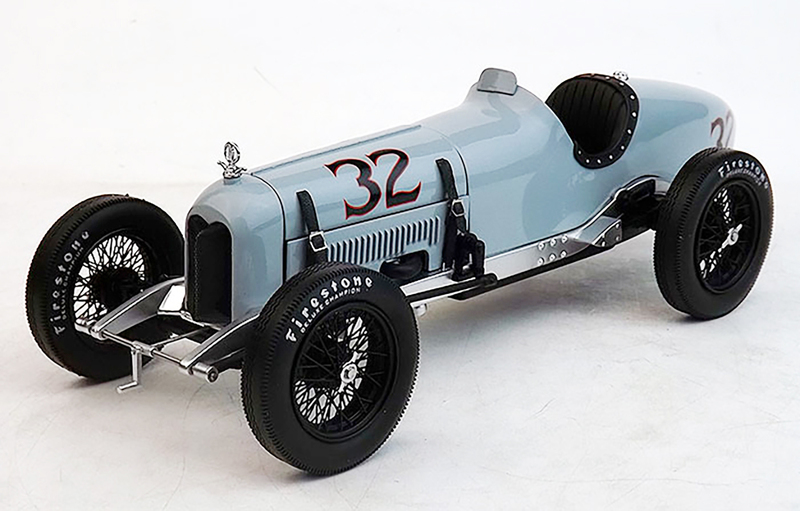 The 1920s racers look simple, but that’s much of their beauty, and Replicarz captures it here.